`Treasure Trails, God Armors & Trimmed! Treasure Trails `Treasure Trails, God Armors & Trimmed! We are beyond excited to announce the official release of RSCRevolution Treasure Trails! Trimmed (g) and trimmed (t) sets of armor. Note: rune trim is actually blue, not white, I have to update the photo. 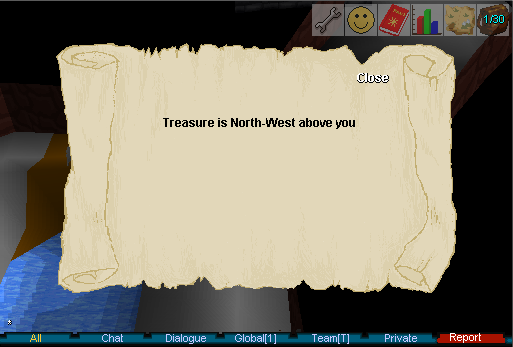 Once you solve the last clue scroll in your trail, you'll be rewarded with treasure. 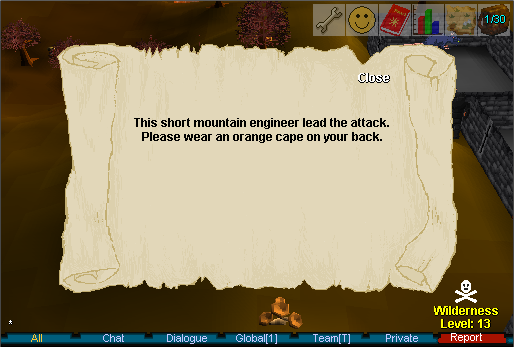 It could be some gems, enchanted rings, coins, or other materials, but there is also a rare chance for your loot to include some of the most coveted armor RuneScape Classic has ever seen! You really ought see them ingame to get a full appreciation. The highest tier of the clue scroll drops are god armors, rune trimmed with the color of the respective god. They also give a bonus of +2 prayer per piece (+1 for helmets). 1. Easy scrolls have a chance to give iron or black (t) and (g) armors. 2. Medium scrolls have a chance to give mithril or adamantite (t) and (g) armors. 3. Hard scrolls have a chance to give rune (t) and (g) armors, or god armors. All new armor sprites by Nisti for exclusive use on RSCRevolution. They've been critical to this project because artists who can make sprites that are faithful to the feel of RSC are a rare breed! Some monsters now have a semi-rare chance of dropping a clue scroll which will take you on a thrilling adventure, just for you. Simply read the scroll to get a hint as to the next step, solve the whole trail and you will have a chance at treasure beyond your wildest 100-fatigue dreams! There are three tiers of difficulty for treasure trails: easy (2-4 steps), medium (3-5 steps) and hard (4-6 steps). Here's a list of the NPCs that have a chance of dropping the coveted scrolls! Cryptic clues contain some riddle which you must understand using game knowledge. Veterans of RSC lore will thrive here! They can require you to dig somewhere, use some object, talk to some NPC or kill some monster. Coordinates clues have a special magic: they tell you which direction the next step is buried in. We thought this was more straightforward and fun than having to deal with a compass and sextant. Don't forget to bring a shovel! Anagram clues say some words which, when rearranged, will spell the name of the NPC you need to talk to next. Equipment clues are like cryptic clues which require you to dig, use some object, or talk to or kill some NPC. The difference is, they also hint at equipment you must wear when you do the action! In total, there are roughly 120 cryptic clues, 90 coordinates clues, 140 anagram clues and 60 equipment clues to keep you guys busy for a while. 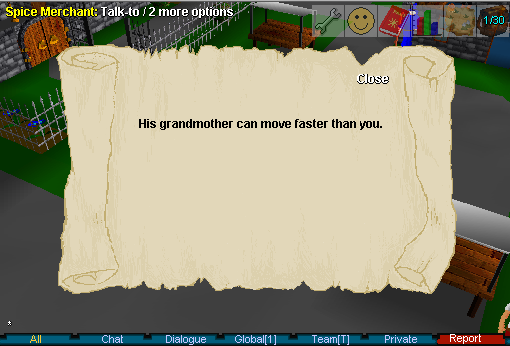 These are absolutely top-notch clues which go from straightforward, to having you wrack your brains and pull up the Wiki or go to our forums for help. Clues designed and written by Billy for exclusive use on RSCRevolution, with a special thanks to Mod Kleio for help making anagrams. For medium and hard clues, adventurers beware! You may encounter a religious zealot who will try to stop you from disturbing ancient artifacts. They attack with melee or cast spells if you're using paralyze monster. The top-tier Saradominist is equipped with poison attacks. 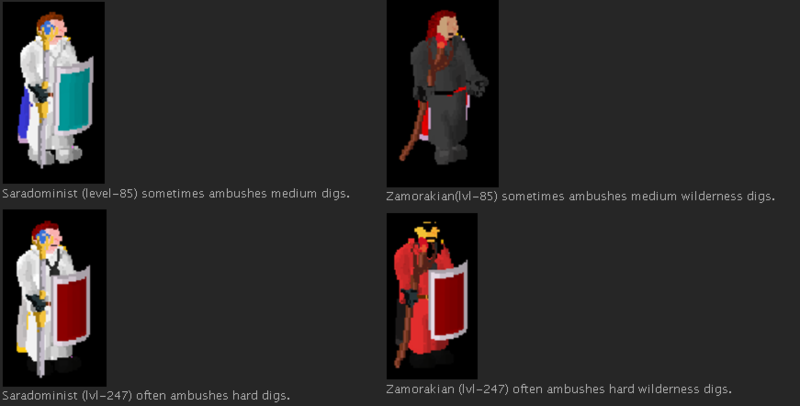 For wilderness digs, you may encounter their chaotic counterpart, the Zamorakian. The Zamorakians only cast spells and do not poison. Be extremely cautious dealing with the hard-tier agents. This, and the entire system structure, was written by project director n0m for proprietary use on RSCRevolution. Agents designed by Billy. Finally, no more clicking or tapping in the top left corner and missing your selection. No more needing to open up your keyboard to tap a number. Now, options appear as easy-tap buttons at the center of your screen. 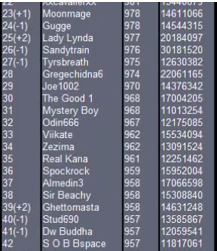 HP, Prayer, Fatigue added to sidebar. This is a feature that has gone in and out of vogue on private servers for years. Currently it will be available only outside of wildy. If people like it we will consider adding it to PKing. In early 2016, we committed to adding a clue scrolls system complete with god armors. We had to put that project on the back-burner after some shakeups at the top. 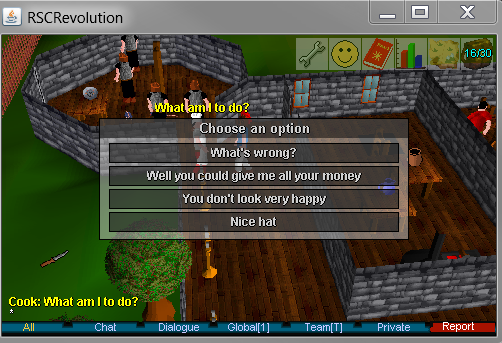 But all along we were thinking how treasure trails done right would be the greatest release in RSC private server history. Then we formed our amazing developer team, and now the day has finally come to release! RSCRevolution staff is far and above the best team in the scene, and this release is a shining example of what's to come. 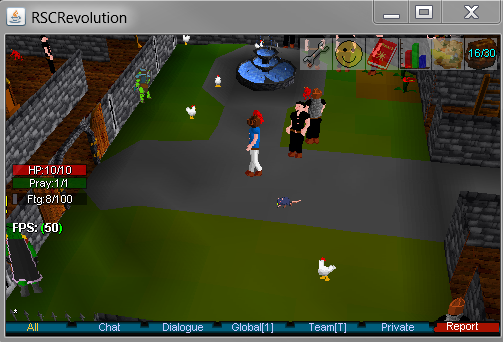 We are giving you one of the best additions to the game from old school runescape / rs2, and remaking it into original content that is faithful to the look and feel of RuneScape Classic, with hundreds of clues for hours and hours of gameplay, completely free of charge! We look forward to invigorating the community with our groundbreaking releases. Also, these are almost entirely original clues so RIP google and HELLOOO FORUMS! Awesome job guys, can't wait to get at it. wow this is pretty awesome so all you have to do is find scrolls and then figure out clues? will scrolls be trade able items? awesome, thank you for your help this shall bring excitement to revolution! Beyond epic! Thanks for your hard work and everyone who helped test the clues system.